How to Boost Curb Appeal in Norton for Commercial Buildings | Boss Services Inc. When you start looking around for a painting company in New England to hire for the commission of a commercial or municipal building, make sure to consider Boss Services, Inc. We are well-known for the work that we do with residential painting in Norton and the surrounding Massachusetts area, but we have also provided our services to corporate, office, retail, restaurant, community and municipal structures throughout the region. One of the best ways to boost curb appeal in Norton, or anywhere else for that matter, is through professional exterior painting. Even historic buildings can benefit greatly from some minor repairs, clean-up and a fresh coat of paint and trim. Whether you are selling your property or just looking to make improvements, our team at Boss Services, Inc. can help you to make the most informed choices available regarding the paint materials themselves, the color and finish of paint, and the timing of the project itself. The time of year, the temperature, and the weather conditions, all play a part in the success of an exterior project, regardless if it is commercial or residential painting in Norton. Consult with our team of highly trained and experienced painters and craftsmen at our popular and well-respected painting company in New England. Are Your Ready to Paint? The first thing you should do when you are considering doing any type of professional exterior painting is the existing condition of the structure. Go outside. Take a look at the property. Try to see it with fresh perspective as someone who is just seeing it for the first time. What kind of impression does it make? One of the many advantages of hiring Boss Services, Inc., is that we are not “just a painting company,” but also a multi-services contractor that has been serving the Massachusetts area since 1989. 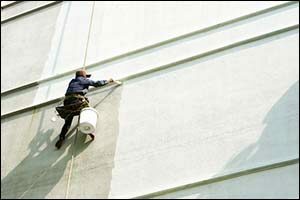 If there are any repairs to be made before painting, our team is qualified to make them. We guarantee our exterior painting with a five-year warranty, despite the fact that our clients are located in one of the most extreme weather locations in the northeast. The rain, the wind, the snow and the sleet of the region can do a lot of damage to exterior paint. However, Boss Services, Inc. has developed a proprietary approach to providing professional exterior painting that is so superior, we are able to offer a five-year warranty. This is a huge benefit to commercial clients, who are constantly taken to task with providing data to prove a return on investment to the financial department of their business owners, board members or municipality. It is possible to boost curb appeal in Norton, while having the peace of mind that the painting company in New England that you have chosen will be painting your building using top quality materials and will even guarantee its success. In business marketing, we have a tendency to choose colors that stand out and are bold. However, when it comes to selecting the best color for your building, subtlety is key. Work with our team of designers and painters to choose the best color for your commercial or residential painting in Norton. The rule for exterior paint is that you should try to match the neighborhood, so if everyone else has chosen a light pastel shade or sticks with white and off-white colors, you should too. Refrain from selecting a bright red or neon orange for your building. While it will attract attention, chances are it won’t be the type of attention that you originally envisioned. A fresh color is a great way to give your building a face lift, but just keep it under control. Once again, work with your painting company in New England to select the best finish for your commercial or municipal building. Similar to interior paints, there are different finish choices available for professional exterior painting. Flat, semi-gloss, gloss, eggshell – all of the options at your disposal will have a different effect on the color and the way it looks when the paint dries. Flat paints are great for covering up subtle imperfections in the structure of a building, while semi-gloss and gloss type paints are great for frequent clean-up and scrubbing. It all depends upon the unique needs of your commercial property. Our team of designers and painters can help you understand your options and point you in the right direction. In addition to painting your building, don’t overlook the importance of trim and accessory items to boost curb appeal in Norton. Check for water spots, scuff marks, discolorations and big scratches on the threshold, door jambs, shutters and other types of trim. In most situations, you should always include the trim work in your professional exterior painting to create complete and quality-looking results. Hiring a reputable company to provide commercial and residential painting in Norton can help you find even more ideas that will help to improve the look of your property. It is important to work with a painting company in New England that guarantees its work, in order to get the best possible results. If you are interested in professional exterior painting for your commercial or municipal building, or if you require residential painting in Norton and the surrounding Massachusetts area, contact Boss Services, Inc. by calling 508-297-0635. Our team will come out to your location, evaluate your needs and provide you with a FREE estimate for your project. We have guaranteed our work with a five-year warranty for over 20 years – we are that confident in our methods, materials and abilities. Call today and see why so many property owners trust Boss Services, Inc.